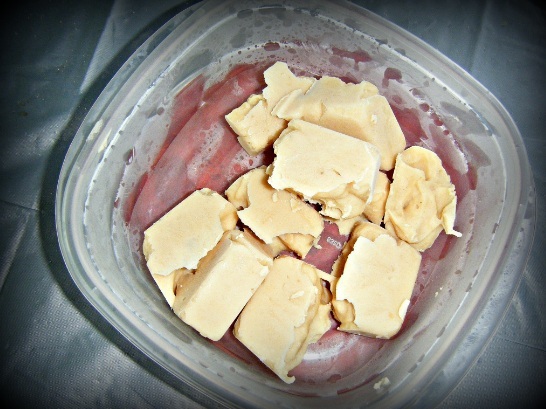 Quick and Easy Peanut Butter and Yogurt Frozen Dog Treats! These frozen dog treats are a summer favorite for our golden! Notice I said “1-2 ice cube trays”, I have made this recipe a couple of times now and I have never produced the exact same quantity. You can alter the quantities to meet your needs, just remember for every cup of yogurt you’ll need a half cup of peanut butter! Combine the peanut butter and yogurt in your mixing bowl and mix thoroughly. I usually spend anywhere from two to five minutes mixing. Once you are satisfied with the mixture, use your spoon to scoop it into your ice cube tray(s). Then, pop the ice cube tray(s) into your freezer for about an hour. After the hour is up, pop the cubes out of the ice cube tray and you can either put them directly into a freezer bag or a plastic container with a lid and put them back in the freezer or you may wish to cut them into halves or thirds first. True to her breed, our golden was a bit ‘piggy’ the first time she tried these treats (I had given her an entire cube) and I am convinced she experienced a ‘brain freeze’. Ever since I’ve been cutting mine into halves and thirds.